Watch the video of our October 13 event on protecting patients from surprise medical bills. Imagine you walk into a hospital for a planned procedure, for example a knee operation to be performed by an orthopedic surgeon. Before you scheduled the surgery, you did your due diligence and confirmed that the surgeon performing the procedure participated in your insurance plan, and that the hospital where you were having the surgery was also in-network. You know that you will still owe hundreds or perhaps thousands of dollars (depending on the details of your insurance coverage or any deductible you need to meet), but you’re certain the costs are manageable and you’re prepared to pay the final amount. The surgery goes well, and you begin your recovery. Then, several weeks later, you get a bill for the surgery that’s much, much more than you expected to pay—maybe even ten or twenty times what you expected to pay. How did this happen? A new paper, Solving Surprise Medical Bills from the Schaeffer Initiative at the Brookings Center on Health Policy, takes a closer look at surprise medical bills in America—and how policymakers can protect patients from them. What are surprise medical bills? You might be shocked to receive the bill, but you wouldn’t be alone. Over the past several years, an increasing number of Americans have been hit with surprise bills for medical care. Surprise medical bills result from providers (physicians, hospitals, out-patient facilities, laboratories, etc.) that patients reasonably assumed would be in-network, but actually are out-of-network, or when patients have no real choice over the network status of their provider. These bills are sometimes the result of emergency situations. None of us, in an emergency, place a call our insurance company to make sure the ambulance we need or the hospital we’re brought to is in-network. Yet you can still be liable for the astronomical bills that result. Other times, patients are billed by out-of-network providers, such as an anesthesiologist, even though patients did everything they reasonably could to remain in-network for a planned medical procedure. As a result, patients incur much higher charges, which often exceed what insurance reimburses, sometimes are exorbitant, and can lead to financial distress. There is bipartisan agreement that this problem exists, is increasing, and needs to be addressed. Important differences exist, however, on how the problem should be solved. Over a dozen states have enacted important protections and federal and state officials have proposed additional remedies, but these efforts are incomplete, and they pursue a variety of different strategies. When situations like these produce surprise medical bills, patients can suffer substantial financial harm. Not only do patients and their health plans lose the advantage of the substantially lower rates typically negotiated with participating providers, out-of-network care is not covered at all by certain types of health plans, such as closed-network HMOs and “EPOs” (exclusive provider organizations). Although out-of-network care is covered by open-network plans, such as PPOs and point-of-service (“POS”) HMOs, patients have to pay much higher deductibles and co-insurance out-of-network. 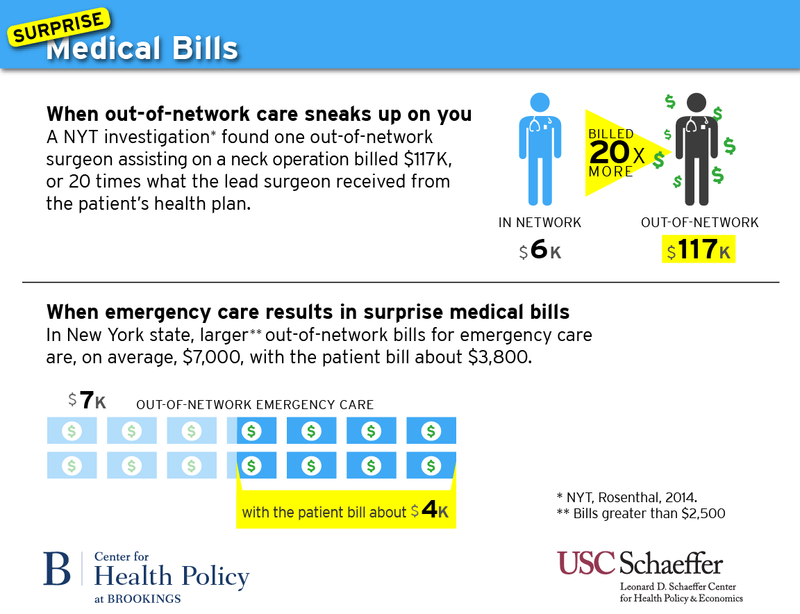 A 2010 study of larger out-of-network bills submitted under New York health plans found that, on average, patients who received these larger bills were charged for about half of the cost of emergency care delivered out-of-network, which amounted to patient charges of $3,778 per case. [i] The same study reported that larger balance bills from out-of-network assistant surgeons averaged $12,120. Who’s most at risk of receiving a surprise bill? State enactment promises greater room for adapting to local market conditions and for continuing to try different approaches. However, federal action may be necessary to protect the approximately one half of privately insured people in self-funded plans federally regulated under the Employee Retirement and Income Security Act of 1974 (ERISA). States have sufficient authority over people in self-funded plans if the remedies are directed only to providers. But if health plans are included, either a federal remedy is needed, or a federal enactment that provides states the necessary authority. Because surprise medical billing is a multifaceted problem, there’s no quick or easy single solution. Instead, a combination of approaches is required, some of which are inevitably controversial. To understand why this is the case, we begin with measures that have achieved significant support but, on their own, are less effective. 1) Take comprehensive action that targets surprise billing situations systematically to include at least all common hospital scenarios, rather than merely emergency situations. Solutions should target all out-of-network billing at in-network inpatient and outpatient facilities, along with all care resulting from emergency screening and patient transfers (including ambulance transport) at out-of-network facilities. Protections should extend to all types of health insurance plans (HMOs, PPOs, etc.). 2) Take federal action that either addresses patients covered by self-funded ERISA plans, or authorizes states to do so. State enactment provides the greatest opportunity for adapting to local market conditions and for continuing to try different approaches. However, federal action may be necessary to protect the half of the privately-insured market that is in self-funded employer plans. 3) Improve transparency and notice to patients about out-of-network situations and charges, but recognize that improved transparency and voluntary efforts alone will not eliminate situations of unfair surprise. Notifying patients sometimes makes it feasible to freely consent to out-of-network billing, but not in the many situations where patients are not able to choose an in-network provider instead. In appropriate situations, for advance notice to be adequate, it should include a case-specific estimate of the extra costs and information about feasible in-network alternatives. 4) Enact measures that hold patients financially harmless from additional costs associated with surprise non-network bills. Although the best remedies for surprise billing can be controversial, the controversy should not deter lawmakers from crafting a solution that holds patients financially harmless when they take reasonable steps, or have no reasonable opportunity, to avoid out-of-network billing. 5) Encourage hospitals to increase network participation by key physician specialists. Regulators could question whether health plan subscribers have adequate access at hospitals that lack sufficient network participation by key hospital-based specialists. This approach needs to be taken with caution however, because hospitals might have to make large financial commitments to such specialists and pass this on to insurers in higher rates for hospitals, costs ultimately borne by consumers through higher premiums. To temper this problem, regulators could use antitrust authority more actively to determine whether market power is being used inappropriately when most hospital specialists refuse to join networks. 6) Select from among several regulatory and dispute-resolution approaches to fairly compensate nonparticipating providers, without distorting health plans’ and providers’ market negotiations. There are two basic options for determining how much health plans should pay nonparticipating providers, keeping in mind the need for administrative feasibility and to avoid unduly distorting market dynamics: regulate provider rates in surprise situations; or mandate a form of a dispute resolution. Together, this multifaceted approach would protect the largest proportion of insured Americans from receiving surprising, stressful, and often financially disastrous medical bills. To learn more, download the full paper by Mark A. Hall, Paul B. Ginsburg, Steven M. Lieberman, Loren Adler, Caitlin Brandt, and Margaret Darling. [ii] Rosenthal, E. (2014a). After Surgery, Surprise $117,000 Medical Bill From Doctor He Didn’t Know. New York Times. Retrieved from http://www.nytimes.com/2014/09/21/us/drive-by-doctoring-surprise-medical-bills.html. [iii] Additional examples of this magnitude can be found in other credible sources, such as Kyanko & Busch 2013; NY State 2012. [iv] This is essentially the approach used in the Health Insurance Portability and Accountability Act of 1996, for portability of group insurance coverage, and in the Affordable Care Act, for insurance exchanges.